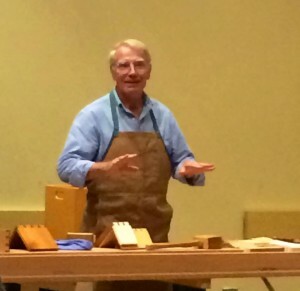 Woodworking in America is well-known for its excellent Marketplace, which we covered in several posts last week (here, here and here, for example). But the conference is also known for the fantastic classes offered by excellent instructors. 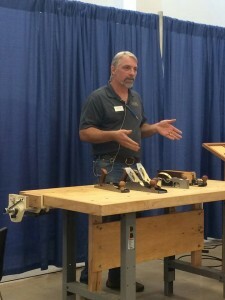 Excellent instructors who you can then walk up to at the end of the class and personally ask that woodworking question that has been keeping you up at night. For most woodworkers, this is the opportunity of a lifetime. 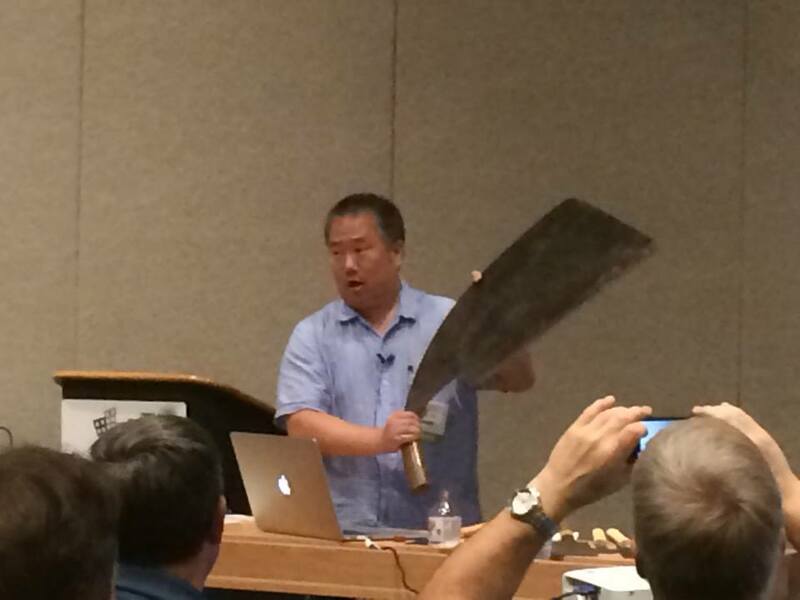 With so many classes offered in the two days, we weren’t able to attend all of them. 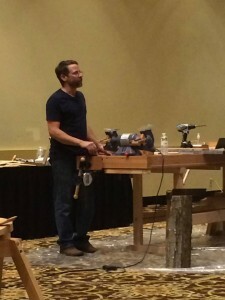 But between the pictures, quotes, nuggets of useful woodworking information and videos below, hopefully you can get a taste of how great it was. And when Popular Woodworking announces the dates for Woodworking in America 2015 (any day now, according to editor Megan Fitzpatrick…) make sure you put it on the calendar and buy your tickets so you won’t miss out! Peter Galbert started his chair making passion when living in New York City and made chairs in a 5th floor walk-up apartment. 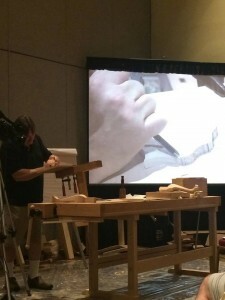 The standard makeup of his chairs includes: A soft wooden seat, turned legs, and a split wood top, which allows for exceptional strength and bend-ability. 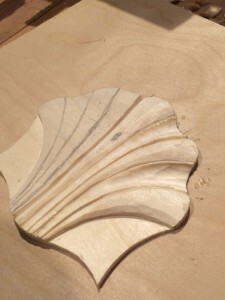 Instead of sand paper, he uses scrapers when finishing his seats, which gives it a better look in the end. 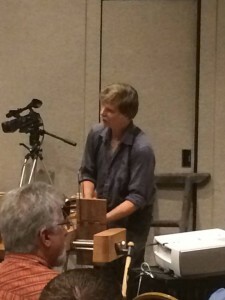 “Forgive me for going down a woodworking nerd rabbit hole…but here we go.” (Discussing the design of his shave horse). In this class Wilbur showed off several different Japanese saws and chisels and described their uses. 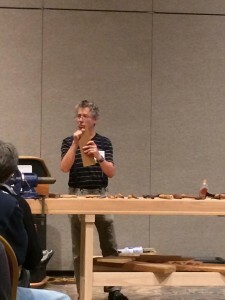 He explained the differences between a Kataba saw and a Ryoba saw (apparently the Ryoba isn’t necessarily a bargain just because it is two saws for the price of one), as well as the how the small details in the design of the Maebiki saw made it ideal for milling down logs. Throughout the centuries there have been a wide variety of finishes based on the materials that were available during that time period. 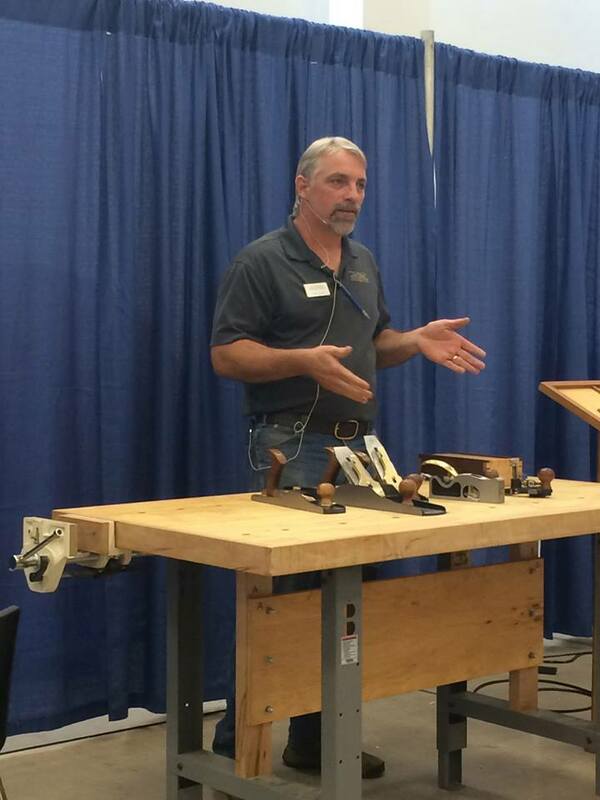 Don showed us a variety of these finishes and techniques, and how we can “apply” them in our shops today! He taught us that finishing is a period of steps where you’re not messing up what you did before. 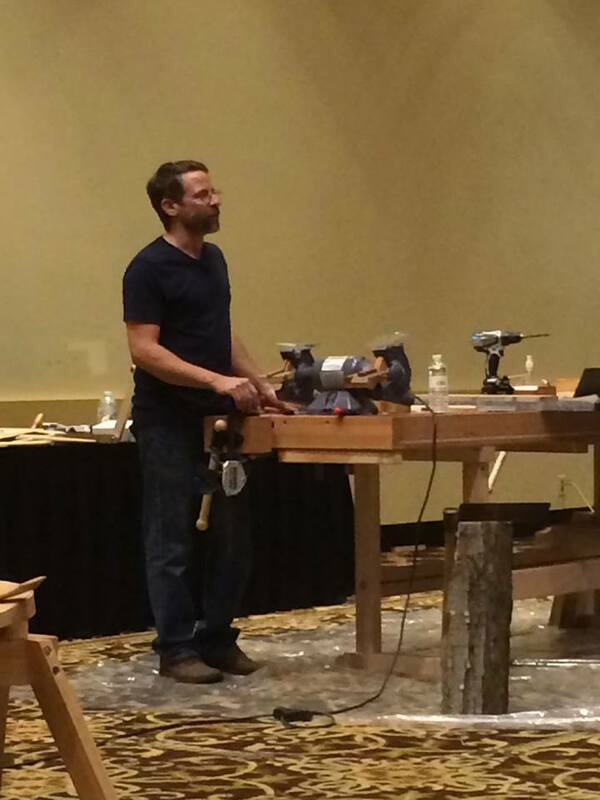 At one point in the class, someone in the audience said he was amazed the planing Don was doing wasn’t tearing up the wood, and Don invited him up to give it a try. In general he was very open to audience discussion and participation in the class. 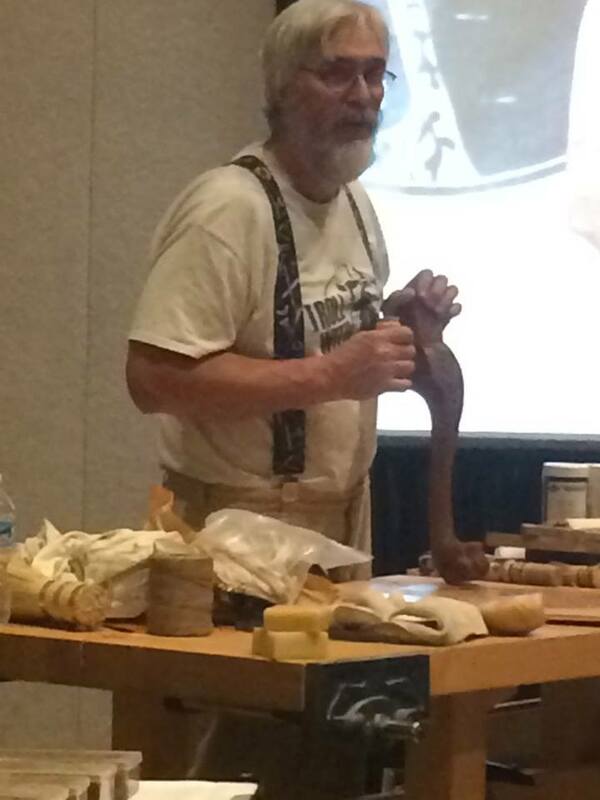 Class quote: “Every time you make a pot roast, you are starting a woodworking project whether you know it or not!”- Don Williams explaining hide glue production. Megan Fitzpatrick gave an informative and at times hilarious presentation on the history of Popular Woodworking and the process she goes through to produce each issue. 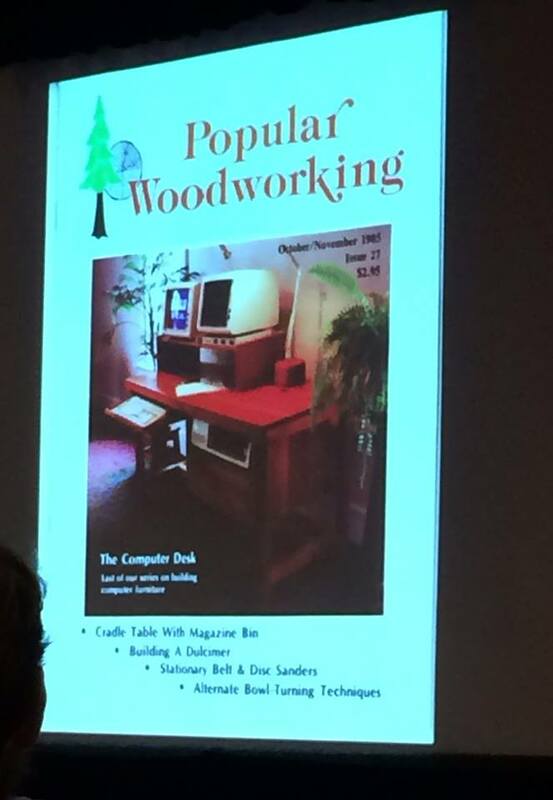 Let’s just say we will never take for granted an issue of Popular Woodworking again! One of our favorite moments from the class (and there were a lot of favorite moments) was Megan telling us about the first issue she edited, and all the red ink she wasted ‘correcting’ all of the mentions of ‘rabbets’ and ‘moulding’. She certainly learned what those words meant by the next issue! 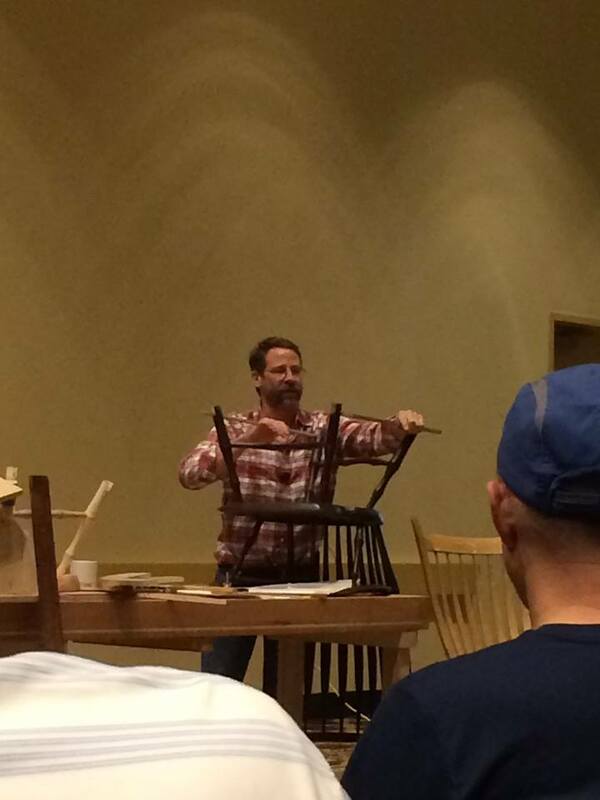 On the second day of WIA, Peter Galbert was up early to teach an 8:30 class on Rocking Chairs. He pulled the rockers off of a chair he had never been satisfied with and used it as an opportunity to demonstrate to the class how he would go about balancing a new set of rockers and aligning them so the chair feels right to the individual sitter. 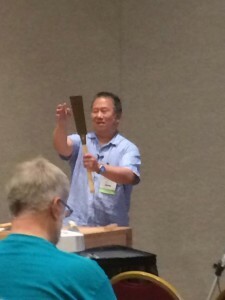 And his reasoning for using the large single ply models to demonstrate? Part 2: W. Patrick Edward’s Building and Using a Chevalet and Wilbur Pan’s Japanese Saws for the Western Woodworker.